Artist's concept of the Lunar IceCube spacecraft searching for water from lunar orbit. A spacecraft the size of a cereal box will soon be hunting for water on the moon. NASA has given the go-ahead to a mission called Lunar IceCube, a public-private partnership that will send a tiny cubesat to do water-ice prospecting from an elliptical orbit around the moon. The spacecraft's observations could aid future robotic and human exploration of Earth's nearest neighbor, mission team members have said. "I believe the future looks bright for science on cubesats, due to their fantastic versatility," Mandell added. "Once we understand how to design these platforms, the possibilities are endless as to what we can do with them." Lunar IceCube is a 6U ("6 unit") cubesat being developed by Morehead State University in Kentucky, with help from NASA Goddard and the Massachusetts-based Busek Company. One "unit" is a cube measuring 4 inches (10 centimeters) on a side; Lunar IceCube strings six of these cubesat building blocks together. Lunar IceCube will probably end up launching with a number of other deep-space cubesats on the first flight of NASA's Space Launch System (SLS) megarocket, which is currently scheduled for 2018. If Lunar IceCube does indeed blast off on the 2018 SLS flight, the tiny spacecraft will deploy from the megarocket and embark on a three-month trek to the moon that features several loops around Earth. This circuitous route — which takes advantage of "gravity assists" from the moon and Earth — was chosen because the cubesat employs low-thrust miniature electric thrusters, scientists said. "Our propulsion system will allow us to naturally capture a lunar orbit," said mission team member Dave Folta, of NASA Goddard, in the same statement. "The force of our low-thrust system is analogous to an ant pushing on the spacecraft over many days. It’s an efficiency thing. That’s the whole point of this low-thrust trajectory." 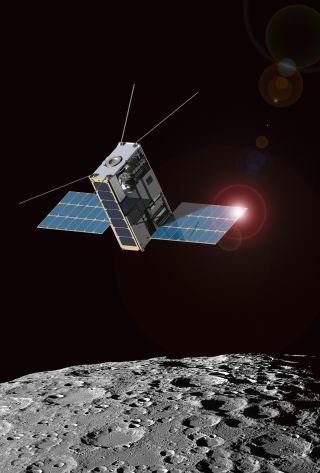 Once it arrives at the moon, Lunar IceCube will use its lone instrument — called the Broadband InfraRed Compact High Resolution Explorer Spectrometer (BIRCHES) — to hunt for and characterize deposits of water ice during a six-month mission. Lunar Flashlight will do similar work, but that cubesat will peer into permanently shadowed craters using its solar sail as a sunlight-reflecting mirror. Lunar IceCube, on the other hand, will search broader areas and attempt to measure water ice distribution as a function of latitude, time of day and regolith characteristics, mission team members said. Lunar IceCube, Lunar Flashlight, BioSentinel and NEA Scout are part of a growing movement to outfit cost-effective cubesats for deep-space exploration. For example, NASA also plans to launch two 6U cubesats along with its Mars InSight lander mission next year, to help relay communications back to Earth during the larger spacecraft's entry, descent and landing operations. Researchers at the space agency's Jet Propulsion Laboratory in Pasadena, California have also built two identical 3U cubesats for the Interplanetary NanoSpacecraft Pathfinder In Relevant Environment (INSPIRE) mission, which will study the structure of the solar wind about 930,000 miles (1.5 million kilometers) from Earth. The INSPIRE duo is ready to go but still awaits assignment to a rocket. "I’m betting that we already have about 100 deep-space cubesat concepts floating around," Pam Clark, Lunar IceCube's science principal investigator at NASA Goddard, said in the same statement. "This is where things are headed."